When it comes to taking the right approach and choosing the program that best fits what you are looking for, it is important that you understand the terminology and all the moving bits and pieces that are involved in the process, that's why this post is dedicated to the J1 Visa Terminology. Rather than applying blindly, it is always better to anticipate any problems you may run into and take all necessary precautions to avoid any confusion or unnecessary complications. Although it may seem complicated, it really is very straightforward, and we are here to help you along the way! You can read about some of the experiences of our past candidates here so that you don’t have to take only our word for granted! First and foremost, you must decide which is the right visa for you, which in the case that you are looking for a cross cultural experience in a leading American firm for up to 18 months, the J1 Visa is the right choice for you! Bear in mind that depending on your marital status and whether you have children or not, they too can take part of this experience and tag along under the J2 Visa status; which will be granted once you have received approval for the J1. Something that we know can be a significant factor when considering this opportunity. Now, think about what your experience level is thanks too the J1 Visa Terminology? And what is the annual salary that you expect to receive from your Host Company? It really all depends on whether you are an intern or a trainee. Additionally, your salary will vary depending on your years of experience and whether you have a degree from a post-secondary institution. Once all of this is settled and you are deciding between the offers that we send to you after you have joined our program and paid the initiation fees, you have to understand the documentation that you will need to receive and that which you will need to fill out and present at your embassy. When the offer has been accepted and the company is already waiting for you to start your program with them, there will be three main documents that you will need to be aware of. One is called the DS-7002, the Training Internship Placement Plan, which be filled out by your Host Company, and the other two are the DS-160, the Online Nonimmigrant Visa Application Form, and the DS-2019, the Certificate of Eligibility for Exchange Visitor (J-1) Status, that you will need to take care of on your end and submit to SEVIS. You will need these documents in order to start the Visa issuance process and do the interview your embassy. From then on is just waiting for the approval, and don’t worry we haven’t had any major complications in the past, and you can always count on us for help along the way and if you have any questions. We’ve placed numerous applicants in leading firms and we would be happy to do the same for you! Now you know almost everything about the J1 Visa Terminology. What's a J1 Visa Sponsor? At Architect-US, we help sponsor your J1 Visa internship or training program in the U.S.! However, many of you may not know what this "sponsorship" exactly entails. So, if you get a J1 Visa or decide to participate in an Exchange Visitor Program to get some working experience in the U.S. like our participant Anja, you need to find the help of a sponsor organization. 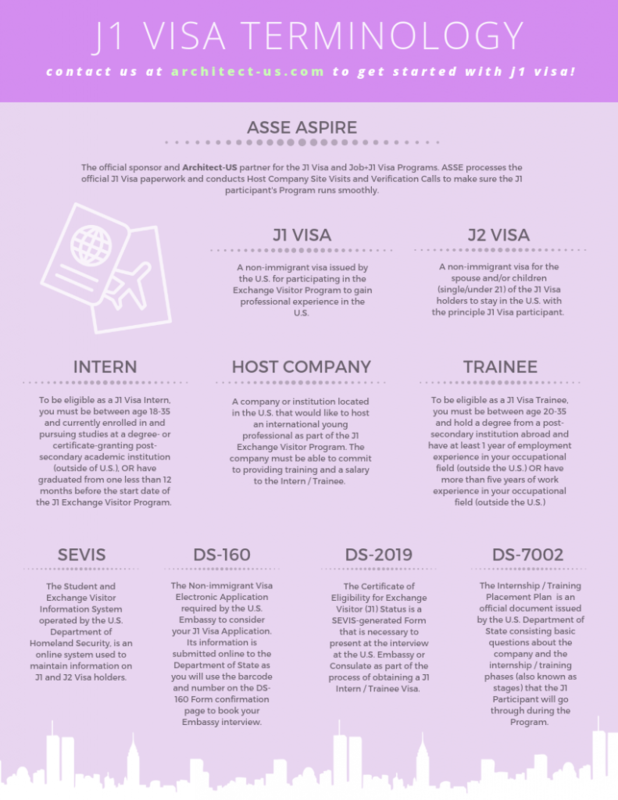 These organizations, including ASSE (an official sponsor that Architect-US works closely with), are licensed by the U.S. government to issue the documents that you need for your visa application including the DS-2019 form. Architect-US will help you with your visa process by taking over the entire communication process with the host company and the organization of your choice. We will instruct you about everything you need for your J1 intern or J1 trainee visa application. With ASSE, we will process the official paperwork and conduct necessary Host Company site visits and verification calls to make sure that your program runs smoothly. Architect-US strives to quickly respond to all our participants' questions, providing all the information and to help you obtain your J1 visa and start your internship or training program in the U.S! Thinking of getting a J1 Visa? It's not too late to contact Architect-US to start today! A Host Company is a company (or entity) located in the U.S. that would like to host an international young professional as part of the J1 Exchange Visitor Program. The company must be able to commit to providing training and a salary to the Intern / Trainee. Read more about Host Company eligibility HERE. What is the DS-7002 Form? The Internship / Training Placement Plan (DS-7002) is an official document issued by the U.S. Department of State. The Intern / Trainee and the Host Company have to fill it out in order to apply for the Internship / Training Program. The document consists of basic questions about the company and the internship / training phases (also known as stages) that the J1 Participant will go through during the Program. The phases show the Department of State that the J1 Participant will contribute to the company's projects and learn more about the respective field during the Program. The DS-2019 (also known as the Certificate of Eligibility for Exchange Visitor (J1) Status) is a SEVIS-generated Form that is necessary to present at the interview at the U.S. Embassy or Consulate as part of the process of obtaining a J1 Intern / Trainee Visa. This document is provided and sent to the Architect-US participants through FedEx by ASSE, the official Architect-US partner and U.S. government accredited exchange program sponsor. A J1 Visa Sponsor is (or works with) a U.S. Department of State designated sponsor for the Exchange Visitor Program, that is authorized to issue the Certificate of Eligibility for Exchange J1 Visitor Status (the DS-2019 Form) - the main supporting document for the application for the J1 Visa. Unlike many other visas and sponsors, with Architect-US the employer (Host Company) isn't responsible for the costs and commitment for the participant's visa - that's between Architect-US and the international. The J1 Visa Sponsor must keep track of the J1 Visa Holders while they are in the United States of America - stay updated on their home address, office environment and professional activities. The Grace Period is a period of 30 days after the end of the participant's J1 Visa program before they must exit the USA. The Grace Period is governed by the U.S. Citizenship and Immigration Services (USCIS) and it allows the international to experience a bit more of the country before leaving and it gives them time to plan their flights and all else necessary for leaving it. What is the Workers’ Compensation Policy? The Workers Compensation Policy is a document the Host Company must have, although the more common form of this is the Certificate of Liability Insurance which we accept as an equivalent. These documents serve as proof that the Company's insurance provides wage replacement and medical benefits in case any employee gets injured during employment. It is obligatory for the Host Company to have the Workers Compensation Policy or proof of legal exemption, in order to be eligible for the Exchange J1 Visitor Program. ASSE Aspire Worldwide is a Department of State official designated sponsor and the main Architect-US partner for the J1 Visa and Job+J1 Visa Programs. ASSE processes the official J1 Visa paperwork and conducts Host Company Site Visits and Verification Calls as part of the J1 Visa application process to make sure the J1 participant's Program runs smoothly. What is the Two Years Rule? The two-year home residency requirement means that those who come the United States on a J1 Visa status can't change visa status, become permanent residents or get work or family-based visas in the USA until they return to their country of last permanent residence for at least 2 years in a row. However, this will affect you if you are on a government funded program, specialized skill program, or graduate medical training program. For more on the 2-year rule, please visit this blog post. What is the Waiting Period between J1 Visas? The waiting period applies to anyone who would like to apply for a new J1 visa program after having already completed a previous J1 Visa program. The waiting period between programs depends on the previous J1 visa program category and your current eligibility. We review such cases in detail to give you a better answer, so please write us about your situation and send us your Resumé with dates (so we can review it) in an email to training@architect-us.com. What is the Expedited Service? The usual J1 Visa process takes about a month from the moment Architect-US receives all the necessary documentation from both sides (the Participant's and the Host Company's) to the start of the program in the USA. However, the process can be expedited at an extra cost to about 2 weeks if the Participant or Host Company require fast processing. However, this 2-week guarantee includes only the aspects of the process which are entirely under Architect-US control, and do not take into account possible delays of the Embassy appointment, delays in returning the passport, holidays or any participant travel arrangements. The Initiation Fee is aplicable only to the Architect-US Job+J1 Visa Program. Once Architecture candidates send their CV and Portfolio for revision and the Selection Committee accepts them for the Program, they must pay a $350 entry fee for the Pool of Candidates. This amount will be discounted from the full Program cost once the candidate is selected for an opportunity and accepts the offer. What is the Consular Fee? The Consular Fee is the amount of money charged by a Consulate / Embassy to arrange an appointment to issue a visa. The J1 visa consular fee is usually about $160, but it depends on the country. May I leave the U.S. and re-enter during the Grace Period? It is not recommended to leave and re-enter the U.S. during the Grace Period taking into consideration that your J1 Visa status will no longer be valid and you may not be permitted entry. The aim of the 30-day Grace Period after your Program End Date is to give you time to prepare yourself for returning to your home country. Will I be treated like an Intern / Trainee even if I have experience? No, these words do not define your responsibilities within the American company. These are terms used by Immigration, but will in no way affect the way you are perceived at your Host Company where your official title could be Junior Architect, Assistant Project Manager, Designer and so on. The terms Intern and Trainee relate to the idea that you will be growing from the experience - diving into a new culture, learning new techniques and expanding your professional knowledge through this international exchange. Architect-US provides J1 visa services that often tie into working with other types of visas. One of the more common concerns from our clients regards transferring their status from F1 to J1 Visa. Most of the time, they are on an expiring F1 OPT period. The easiest option for F1 Visa holders to stay in the U.S. for a period of time after graduation is through the F1 Optional Practical Training (OPT) period. Foreign students in F1 status are generally eligible for OPT, a post-study work option where one can legally work in the U.S. for a certain period of time, depending on your field. Recent grads generally have up to 12 months of OPT period, unless they used the period prior to graduation as well. If your occupation is in the STEM category, you are eligible for an additional 24 months for a total of 36 months. But what do you do once this period ends? change from F1 to J1 Visa. At this point, many turn to the J1 Visa because the process is simpler than other options, including lower costs, not requiring sponsorship of a company, etc. Learn more about how to transfer from F1 to J1 Visa with Architect-US! What is the DS-160 Form? The DS-160 is the Non-immigrant Visa Electronic Application form that is required by the U.S. Embassy or Consulate to consider and to process your J1 Visa Application. Its information is submitted online to the Department of State as you will use the barcode and number on the DS-160 Form confirmation page to book your Embassy interview. To be eligible as a J1 Visa Trainee, you must be between the age of 20 and 35 and either hold a degree (or professional certificate) from a post-secondary institution abroad (outside the U.S.) and have at least one year of related employment experience in your occupational field (also acquired outside the U.S.) OR have more than five years of work experience in your occupational field (outside the U.S.). Keep in mind that the word "Trainee" is a term only used for immigration purposes and it doesn't have to affect your stipend, responsibilities or title at the American Host Company. To be eligible as a J1 Visa Intern, you must be between 18 and 35 years old and be able to prove that you are either: currently enrolled in and pursuing studies at a degree- or certificate-granting post-secondary academic institution (outside of U.S.), OR have graduated from one less than 12 months before the start date of the J1 Exchange Visitor Program. Keep in mind that the word "Intern" is a term only used for immigration purposes and it doesn't have to affect your stipend, responsibilities or title at the American Host Company. The Employer Identification Number (EIN) (or Federal Tax Identification Number) - a field for the the Host Company to fill out in the DS-7002 Internship / Training Placement Plan - is used to identify a business entity and all registered companies must have one assigned. The EIN is also used by employers to report taxes. Before submitting the application for the J1 Intern / Trainee visa, all applicants must pay the SEVIS fee, as required by the Exchange Visitor Program regulation for to the issuance of the Form DS-2019. It costs $180 but it is included in the Architect-US program fee. For more information on what is included in the Program cost read HERE and for what isn't - HERE. SEVIS, the Student and Exchange Visitor Information System, that is operated by the U.S. Department of Homeland Security, is an online system used to maintain accurate and up-to-date information on J1 and J2 Visa holders (non-immigrant exchange visitors).